I triple the bottom layer and double the other layers for larger pans. When I double the pudding layer I substitute one pkg. Lemon Pudding for Pistachio. 1 Cube Butter, room temp. Mix above ingredients (I use a pastry blender), then spread in 9 x 13 pan. Bake in regular oven @ 350° 10-15 min. (light brown color). Let Cool. When mixed, spread evenly on cooled crust mixture. Soften 8 oz Cool Whip and spread over pudding layer. 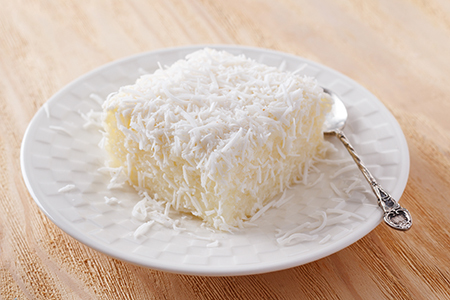 Sprinkle top with toasted coconut. Refrigerate at least two hours. Will last for two days, after that crust becomes a little soggy.